Wounded and in Corinth hospital November 1863. Isaac McCarver originally enlisted with the 21st TN Inf (CSA) from June, 1861 to June, 1862. 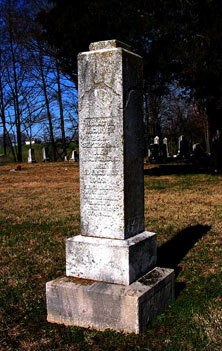 He fought at Belmont, MO, Union City, TN, and Corinth. Two weeks after Mustering Out from the 1st Alabama, he went on to serve with the 1st TN Light Artillery and completed the war with them. He was mustered out, permanently, in Aug, 1865. Picture submitted by Bill Hathcoat.